Three ETF! Artists at the Citizen Art Days in Berlin from September 27th until October 6th, 2013. Ayumi Matsuzaka and Folke Köbberling are participating at the Citizen Art Days initiated and curated by Kerstin Polzin, Stefan Krüskemper, María Linares from Parallele Welten. 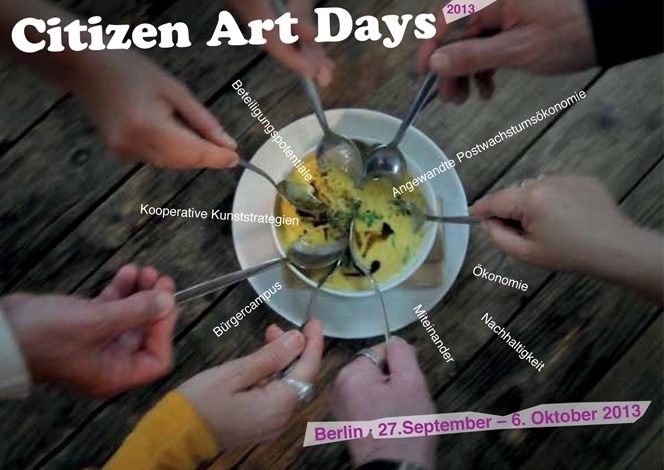 Cititzen Art Days means: Actively participate in the shaping of your city. Develop creative projects together with renowned artists. Contribute your own ideas on important issues of today. Share experiences and inspire each other. Citizen Art Days offers: Workshops, lectures, discussions and city explorations by and with artists and for anyone interested. Creative work and exchange. Subjects are: economy, sustainability and interaction in public space in Berlin.